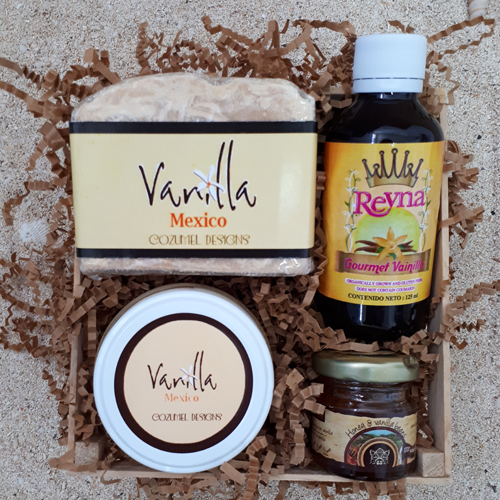 Vanilla from Mexico flavors this gift-wrapped basket. 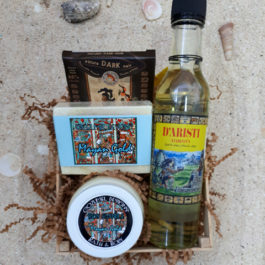 Included is a 5 oz bar of handmade Vanilla from Mexico soap enhanced with vanilla beans and paste, a 4 oz handmade Vanilla from Mexico soy candle which scents your room with the comforting vanilla aroma, and a 125 ml bottle of Mexican Vanilla plus a 1 oz sample jar of Honey with Vanilla to add the authentic vanilla taste. A little bit of Mayan culture influences this gift-wrapped basket. A 5 oz bar of Mayan Gold handmade soap and 4 oz handmade soy candle are an exotic blend of sweetness, warmth, and spice. 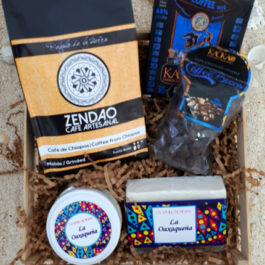 Included also is a 30 gr bar of Dark Chocolate from Kaokao Chocolates and a 250 ml bottle of Xtabentùn, a traditional Mayan drink made from the nectar of the Xtabentùn flower native only to the Yucatan. 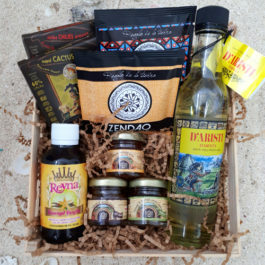 The flavors of Mexico fill this large gift-wrapped basket. 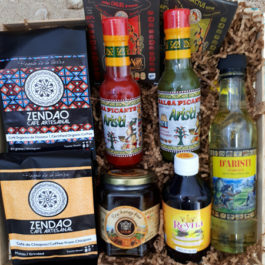 Loaded with an 8 oz bag of both our Zendao Cafè Artesanal coffees – Chiapas and Oaxaca Organic, a 300 gr jar of Mexican Pure Honey, 250 ml of Mexican Vanilla, 30 gr bars of both Chocolate with Nopal and Chocolate with Chili from Kaokao Chocolates, a bottle of each Spicy Habanero Sauce – Salsa Roja and Salsa Verde, and a 250 ml bottle of Xtabentùn, the traditional Mayan liqueur.